Each year millions of Canadian and international tourists descend upon Toronto, one of the largest, and most cosmopolitan in North America. Toronto is a bustling city with a variety of different urban attractions. Attractions include one of the world`s tallest freestanding structures the CN Tower, elegant Eaton Centre, and the serene natural get away centre island. With a compact down town core the majority of these tourist`s destinations are within a 20 minute walk of Union – the cities central – station. The top destinations these tourists visit are. 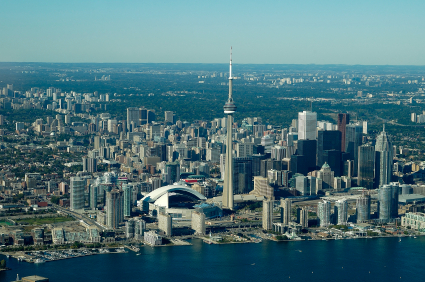 Standing at more than 1,800 feet this tower, once the tallest free standing structure in the world, provides a fantastic bird`s eye view over downtown Toronto and nearby Lake Ontario. A glass elevator, with a glass floor, carries people up 1,200 feet to the indoor/outdoor observation deck for these wondrous views. Royal Ontario Museum (ROM) is intriguing for its exterior appearance alone even if you do not step inside of it. Inside the ROM are more than 40 galleries of art, archaeology, and natural science. These diverse galleries also comprise one of the world`s best collections of artefacts from China, a 6 storey high totem pole, and varied exhibits detailing Canadian wildlife and dinosaurs. Wandering around an always packed downtown may make you wish that you could escape out to nature. Well… there is actually on Centre Island – a matrix of tiny islands – that has become a carless refuge for Torontonians look to relax on a warm day. Just a ten minute ferry ride on Lake Ontario Centre Island features beaches, parks, restaurants, and even an amusement park. Eaton Centre is a bright large shopping mall right in the heart of down town Toronto. With more than 250 varied stores there are shopping options for fashionista all the way down to the spend thrift. Housed within a large glass dome and encompassing four levels this mall is an intriguing location to enjoy modern, urban architecture as well. Similar to Hearst Castle in California Casa Loma represents a wealthy man – Toronto business man Sir Henry Pellat – ambition in the early 1900’s for a grand, European style castle/home. Casa Loma, which has been dubbed `the house on the hill`, overlooks the city core and is of interest to tourists and architecture enthusiasts alike.